The Marine and Coastal Access Act 2009 mandated the development of marine planning in UK waters and this approach is also recommended by the EU’s maritime policy. However in the Irish Sea there are 6 different national adminsitrations (England, Northern Ireland, Scotland and Wales together with the Isle of Man and the Republic of Ireland), all at different stages of development re marine planning. In order to facilitate good dialogue and pre-empt potential conflicts, in 2011 the North West Coastal Forum partnered with Liverpool University and the National Oceanography Centre to organise and facilitate a series of Economic and Social Research Council (ESRC)-funded workshops bringing together planners from all 6 administrations to network and share information. 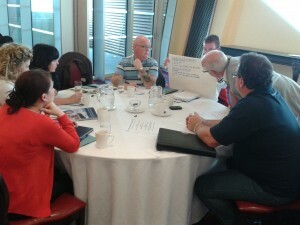 The objectives of the workshops included reviewing existing transnational partnership initiatives in the Irish Sea in order to consider how these relate to the future needs of marine spatial planning and to identify potential gaps; and to develop an agreed plan of action to foster improved transnational partnership working in support of national level marine spatial planning and a joined up approach to action in the Irish Sea. Following the two meetings, an overview report was prepared by Sue Kidd of the University of Liverpool; this includes summaries of stakeholder discussions and next steps to be taken by stakeholders to facilitate further transnational partnership working in the Irish Sea. To encourage and maintain political support for transnational partnership working in support of marine planning, with the aim of promoting sustainable development in the Irish Sea region. Work towards this has been guided by a initial Steering Group of representatives from the various marine planning agencies around the Irish Sea with administrative support coming from the University of Liverpooland the North West Coastal Forum. 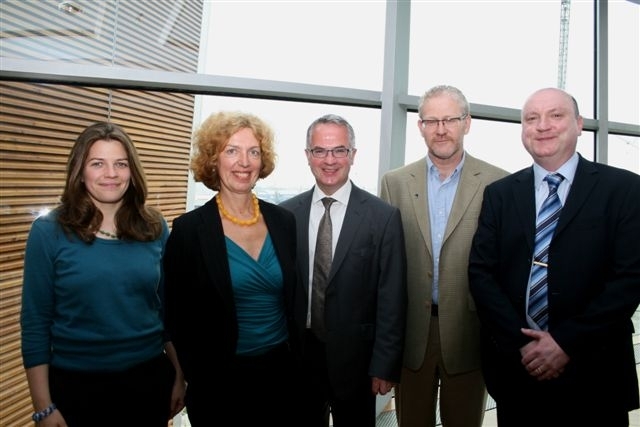 The Irish Sea Maritime Forum has now been launched at a very successful event held at the landmark Titanic Belfast on 28th June 2012. Attended by 80 delegates from around theIrish Sea the Key Note Address was delivered by the Northern Ireland Environment Minister Alex Attwood MLA. Delegates were updated on marine planning in each of the administrative areas in the Irish Sea, with talks from Eugene Nixon of the Irish Marine Institute, Anna Donald, Head of Marine Planning and Strategy, Marine Scotland, Steve Brooker, Head of Marine Planning, Marine Management Organisation, Liz Charter, Chair of Marine Spatial Planning Officer Group, Isle of Man Government and Dr Anthony Quinn of the Irish Planning Institute. Although no-one from the Welsh Government was able to attend information on the state of play in Wales had been sent and this was included in the delegate packs. In the afternoon Flo Clucas, Leadership Group for the Atlantic Forum updated delegates with forthcoming opportunities in EU funding and regional seas strategy and Dr Stephen Atkins of the North Western Inshore Fisheries and Conservation Authority gave an interesting and sometimes challenging perspective on Irish Sea working which prepared the delegates well for the workshop session that followed. The workshops focussed on identifying key next steps for the Forum. The report from the launch event, which includes the programme of work for 2012/13 is available below together with the available presentations from the event (Marine Planning in Wales was not presented but was provided for the delegate packs). These activities will be supported by an extended stakeholder Steering Group, stakeholder consultations on the key work items and the 2 events outlined below. Please note that there will be sponsorship and exhibitor opportunities at this event.